Pres. Ahmadinejad, pictured here May 18, was in Khorramshahr to mark its liberation from Iraqi occupation. 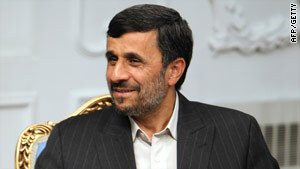 (CNN) -- President Mahmoud Ahmadinejad's speech in southern Iran was marred Monday by unemployed citizens demanding jobs. Hundreds of people attending the speech in the southern port city of Khorramshahr chanted, "We are unemployed," and muttered amongst themselves while Ahmadinejad was speaking. The president had to raise his hand several times to quieten the crowd. Iranian state television showed security officers salted throughout the attendees. Ahmadinejad was in Khorramshahr to mark the 28th anniversary of the city's liberation from Iraqi occupation by Iranian forces. Iran's unemployment rate stands at 11 percent, with the younger generation hardest hit. Seventy percent of Iran's population is under the age of 30. Earlier this month, protests broke out at a Tehran university when Ahmadinejad visited for an awards ceremony. Members of the Islamic republic's opposition movement chanted anti-government slogans aimed at Ahmadinejad's hard-line regime outside Shahid Beheshti University in northern Tehran. While dissent has been rare and the country tightly controlled since the 1979 Islamic revolution, unrest exploded in Iran last summer following the disputed presidential election in which Ahmadinejad decisively defeated opposition candidates Mir Hossein Moussavi and Mehdi Karrubi. The two opposition leaders accused the government of stealing the election. Moussavi and Karrubi have called for more demonstrations on June 12, the first anniversary of the disputed vote. CNN's Mitra Mobasherat contributed to this report.